The adrenalin seems to rush through my veins when I first set off on a long walk and the temptation is to burst out of the blocks like an Olympic sprinter. However, with the prospect of 13 switchback miles ahead of me I was determined, on this occasion at least, to ease slightly more gently into the day. The neat farmstead of Hartside lies at the end of the public road through the Breamish Valley and is a popular starting point for walkers visiting the aptly-named Linhope Spout waterfall or the loftier Hedgehope Hill. I had no intention of visiting either. Instead, I left the buildings behind, headed west across an expanse of windswept heather moor to Rig Cairn, a tiny green island in a sea of August purple, and then on to the grass-covered High Cantle. The views reached out in every direction. 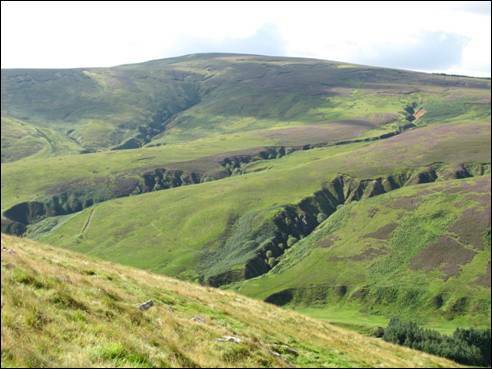 To the north, the high tops of Comb Fell and The Cheviot caught the eye whilst below the walking pole-straight Upper Breamish Valley cut a deep trench through an endless array of steep-sloped hills. From this airy summit a knee-jarring descent rapidly delivered me to the valley bottom and the tranquil banks of the beautiful River Breamish. I ignored the recent replacement footbridge, crossed the river via the adjoining shallow ford and followed the route of the ancient, border-crossing Salter`s Road over Nagshead Knowe. I was now in full flow and before long I was standing on the edge of the Uswayford Forest with less than one mile to go to the summit of the sixth highest hill in the range. However, with 142 metres of sporadically rough ascent between me and the boggy top of Bloodybush Edge I first needed to fill up my lungs. In the event, the summit-crowning triangulation pillar was reached at a canter and, as I was keen to keep the momentum going, I continued on to Cushat Law, two boot-squelching miles away. Known affectionately as `The Monarch of Kidland`, this hill is a mere 14 metres higher than its neighbour and sports a fine shelter cairn. I needed no persuading to take a break in this delightfully isolated location. After a leisurely lunch a long descent over the shapely, grass-carpeted Bush Knowe ultimately led me to the heather-mottled south western slopes of Shill Moor and another brief encounter with the Salter`s Road. From here there are a number of ways I could have returned to Hartside. I chose the most strenuous, straight over the top of Shill Moor from where I enjoyed, for the umpteenth time, the outstanding 360 degree panorama. I then left the high ground behind and made my way sharply downhill to the single track Alnhammoor road and the mainly level trek back to Hartside. Along the way I made a short detour to Meggrim`s Knowe to visit the tiny 2009-erected memorial to 24 year old Pilot Officer Martin Walter Rivers who, on the 25 April 1941, was killed when his Hawker Hurricane stalled and crashed during a solo training flight from RAF Ouston. I felt fortunate to be on my way home.